Rod, My name is Karl Atwood and my grandmother's maiden name is Alice Ulissa Bigelow, daughter of William Henry Bigelow. And her mother's name is Alice (Betts) Bigelow. I have attached three pictures: 1. The Bigelow family on the old farm at Maple Landing, Iowa, 2. Alice as a young woman and 3. 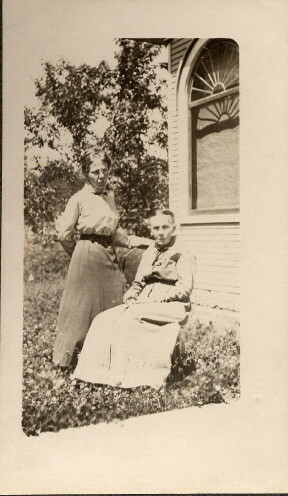 Alice with her mother, Alice (Betts) Bigelow. We have other pictures including some like that of "William and Alice..." and "grandma Alice..." shown on your website. There are a couple of corrections that you can make to your website regarding my grandmother. She was born 19 May 1876 in Iowa and died at the age of 86 at St. Elizabeth's hospital in Yakima, Washington on 31 March 1963 (she did not die 28 Oct 1957). 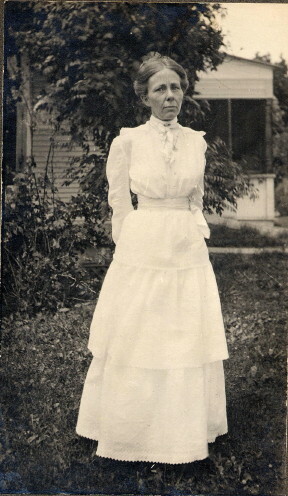 She married Charles Clarke Atwood in Monona County, Iowa on 8 July 1898. (She was not married to Charles Hamilton.) Charles Clark Atwood was born on 16 October 1869 and he was the pastor of the Christian Church in Chester, Nebraska. He died on 8 October 1918. They had one son, Henry Smith Atwood, who is my father. My father was a medical doctor in Yakima, Washington. My grandmother, Alice, had a second husband, Edward Marian Harrison, and they were married in Whiting, Iowa on 15 August 1923 or 1924 (year was not on marriage certificate). He was a farmer until he died on 13 January 1938. After that, Alice moved to Yakima to be near her son and grandchildren. In addition to the sisters and brother mentioned, my grandmother also had a little baby brother, Calvin Lee Bigelow who was born 18 September 1873 and died 26 April 1874. (Based on an entry in her birthday book.) There are other discrepencies which could be explored between what is listed for birthdays and deaths on the website and what is in my grandmother's birthday book. Her book shows that William Henry Bigelow died on 8 September 1911.